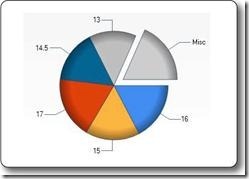 The Chart Helper - One of many useful ASP.NET Web Helpers. In the previous chapters, you learned how to use an ASP.NET "Helper". You learned how to display data in a grid using the "WebGrid Helper". 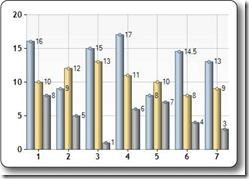 This chapter explains how to display data in graphical form, using the "Chart Helper". The "Chart Helper" can create chart images of different types with many formatting options and labels. It can create standard charts like area charts, bar charts, column charts, line charts, and pie charts, along with more specialized charts like stock charts. The data you display in a chart can be from an array, from a database, or from data in a file. Chart(width, height [, template] [, templatePath]) Initializes a chart. Chart.AddLegend([title] [, name]) Adds a legend to a chart. [, xField] [, yValues] [, yFields] [, options]) Adds a series of values to the chart.